Last year during Top-toberfest I had a newborn baby. I made him the sweetest little sweatshirt, made up a pattern, and then it never found it's way into the series. So, one year later, I'm finally sharing it with you. Unfortunately a few of the tutorial photos were deleted from my computer, so I'll do the best to fill in the gaps. 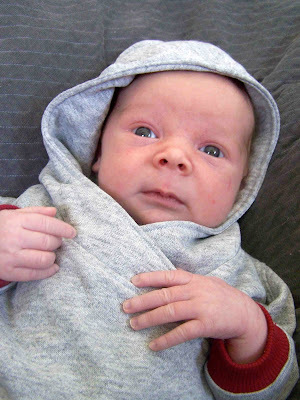 I loved this sweatshirt for a newborn. 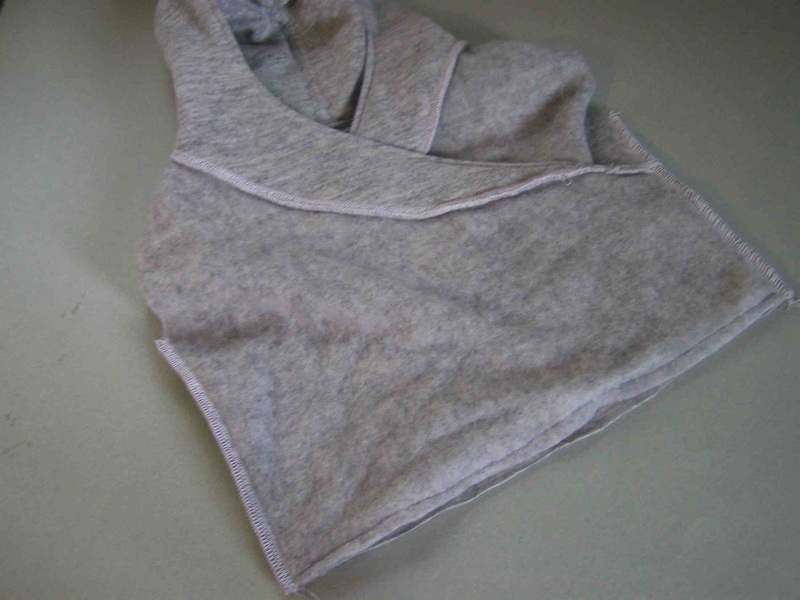 The lapped front, allows you to pull the sweatshirt off an on with ease. No zippers, no buttons, no snaps. Easy on, easy off, and a relatively happy baby (what baby really loves having their clothes changed). 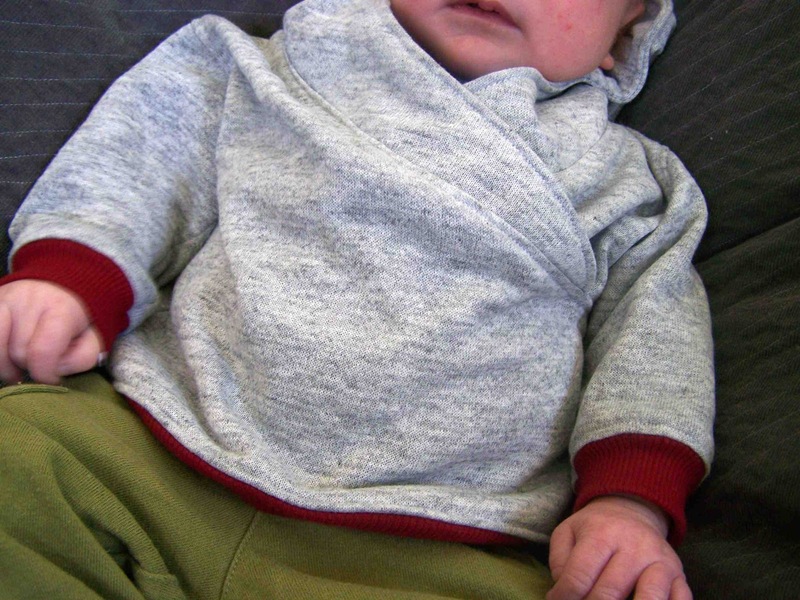 This sweatshirt pattern is gender neutral-hooray. 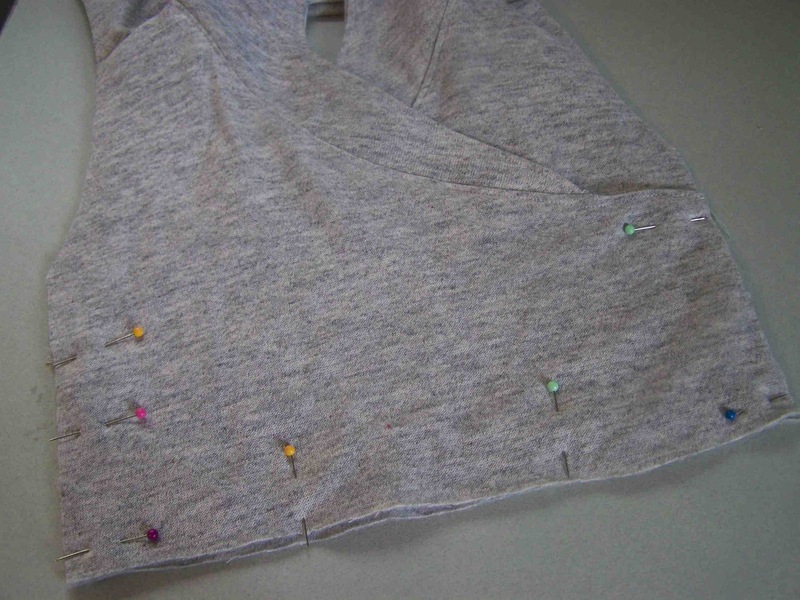 I made a really basic sweatshirt with the materials that I had on hand, but you could really dress it up with pockets, buttons, trims, etc. 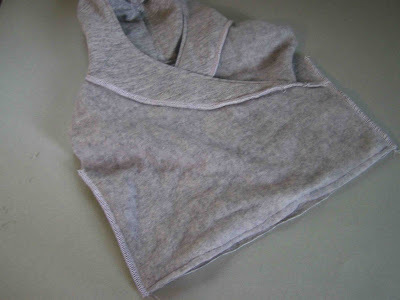 1 yard of sweatshirt fleece (estimate...I used a remnant piece). Cut out pattern pieces according to pattern instructions. Place hood pieces, and hood lining pieces right sides together. Pin along the outside curve. Sew together. Notch the curve to ease fabric for turning. 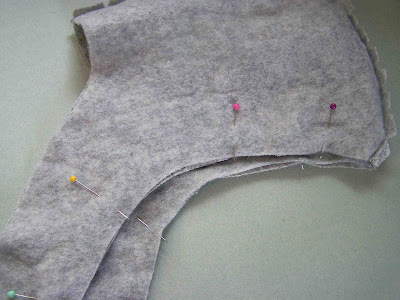 Place hood and lining pieces right sides together, match up seams, and pin along the inside curve. Turn hood pieces right sides out. Press. Topstitch along the new seam. Stay stitch along the bottom raw edges of the hood to secure pieces for attachment. 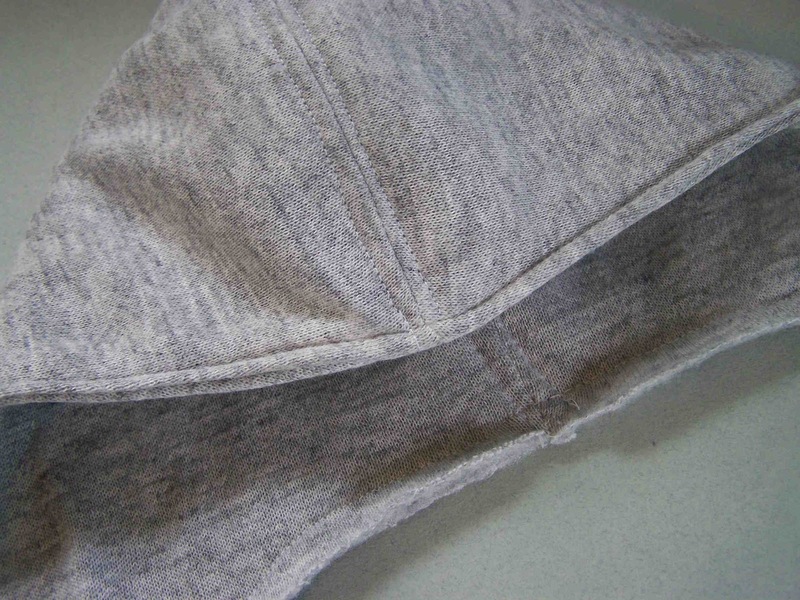 Stitch 1/8" away from either side of the center hood seam to secure hood and lining. Contrast stitching anyone? Take your front sweatshirt pieces, and your back sweatshirt piece, and sew together at shoulder seams. Attach the hood to the sweatshirt. 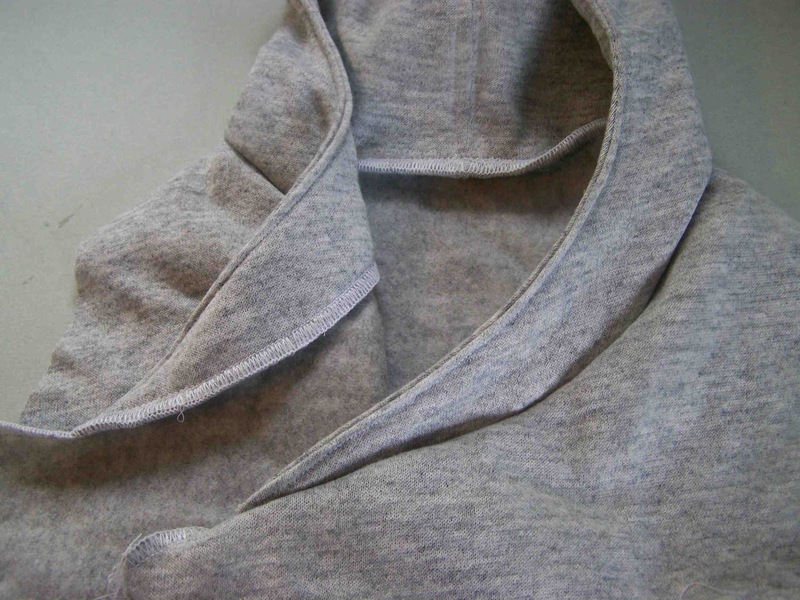 Match up the center hood seam with the center of the sweatshirt back. Right sides of fabric should face each other. 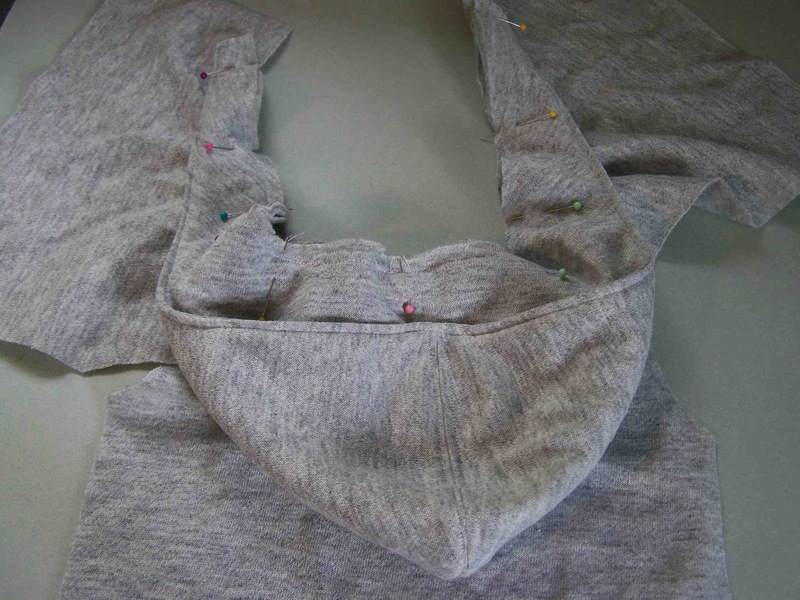 Pin along the remaining tails of the hood, as you near the ends of the tails, angle the tails down so that the topstitched edge curves into the seam. Stitch in place. Better picture? Press seam down. 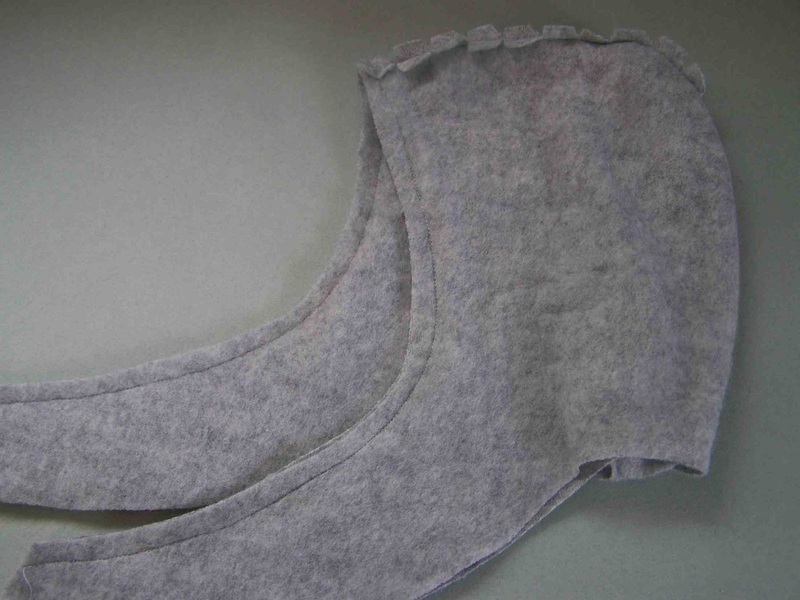 The hood tails will not meet up with the side seams. Next, cross the front pieces over one another. Pin along side edges and bottom edge. 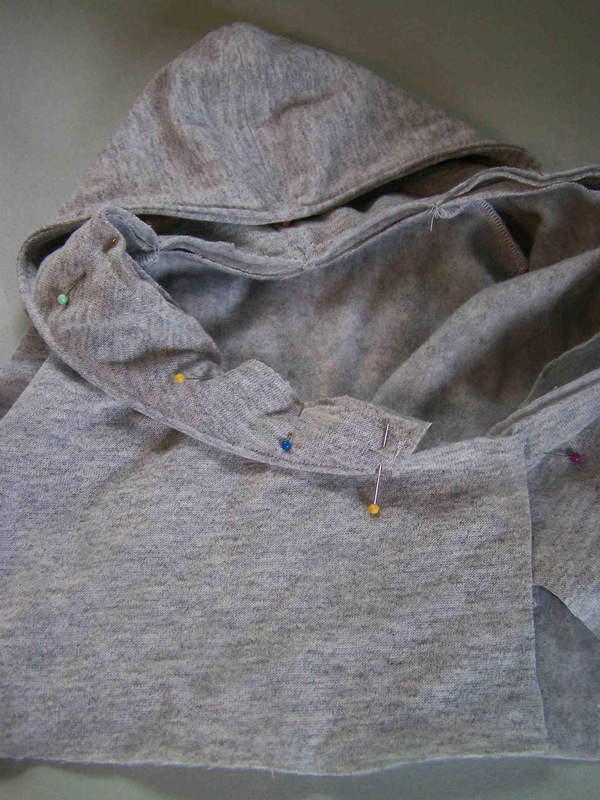 The back sweatshirt piece should not be pinned at this point. Secure layers by stitching 1/8 inch away from raw edges. 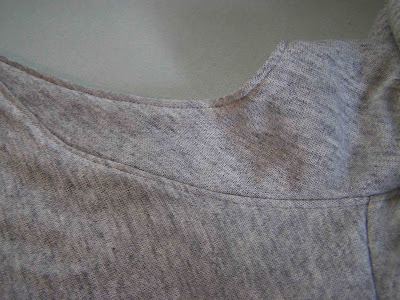 Place right sides of sweatshirt front and back together. Match up side seams. Sew side seams. Next for the sleeves. You can attach the ribbed knit however you'd like. sewing cuffs in the round on infant clothing isn't my favorite, so I used a cheater method. First off, you need to measure the width of the bottom of the sleeve (because I've misplaced my notes). 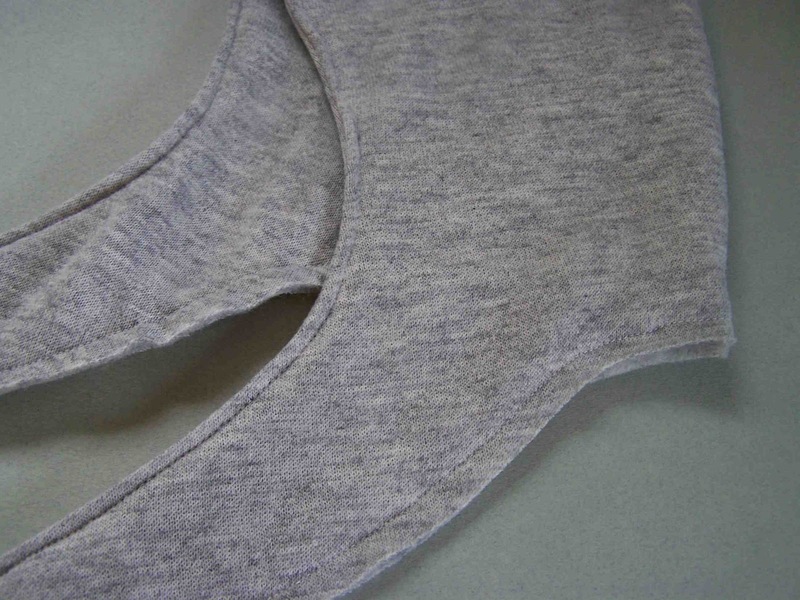 You will cut your strip of ribbed knit into two pieces that are 3/4 as long as the width of your sleeves. 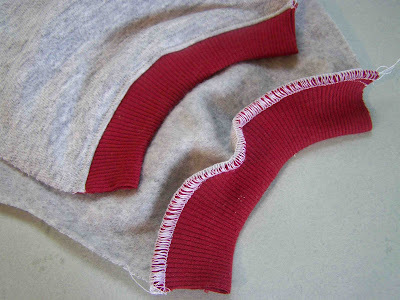 Once your strips are cut, press the ribbed knit in half. Find the center point of the sleeves and the ribbing. Pin in place, right sides together, matching up raw edges. Stretch the ribbed knit to the length of the sleeves. Pin and stitch. Press seam up, top stitch 1/8" away from seam to secure seam. Now we enter the NO PICTURE ZONE. You are going to finish your sleeves, and set them in. If you've sewn shirts before, it's just the same as we usually do it. Fold the sleeve in half, sew along the length of the sleeve (bottom left). Turn the body of the sweatshirt inside out. Insert the sleeve (right side out), into the body of the sweatshirt, cuff first. Match up the center of the sleeve with the shoulder seam (bottom right). Pin. Match up the sleeve seam with the side sweatshirt seam. Pin. 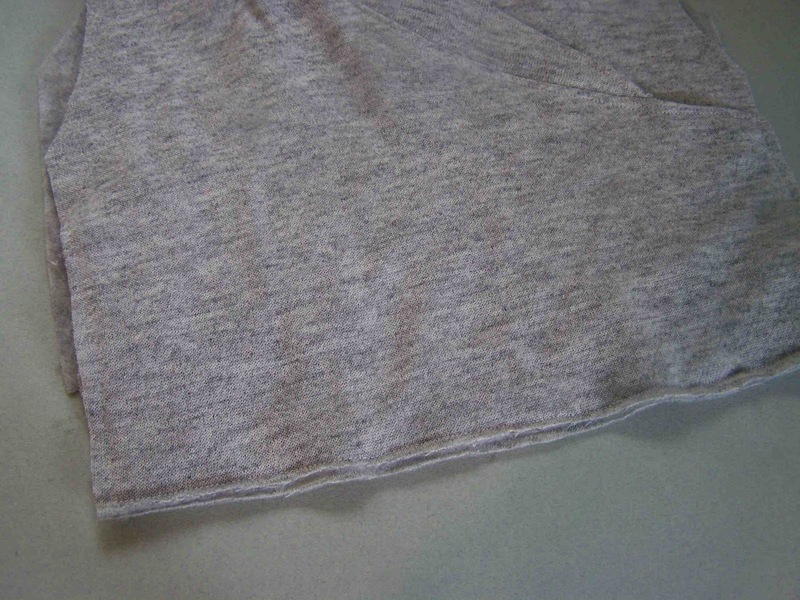 Right sides of the sleeve and sweatshirt should be facing each other. Starting at the side seam, sew around the sleeve, stretching fabric as needed, to evenly distribute fabric. Repeat on remaining sleeve. 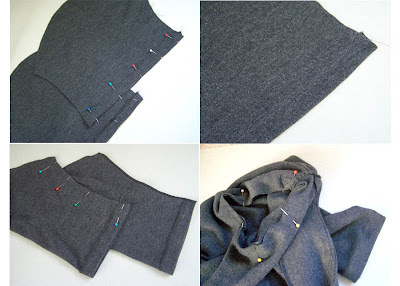 Attach the waistband to the sweatshirt. Measure the circumference of the bottom of the sweatshirt. Cut your ribbed knit down to 3/4 the length of the circumference, plus 3/4" for seam allowance. Match up short ends of ribbing, stitch 3/8 inch away from raw edges. Press seam open. 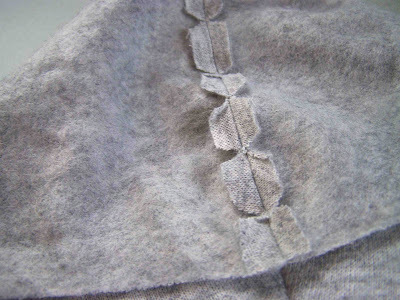 Fold the ribbing in half, reducing the width of the waistband by half. You should now have a loop of ribbing, with raw edges matched up. Attach the waistband to the bottom of the sweatshirt by matching right sides, and raw edges. 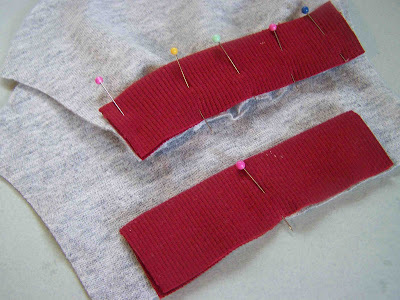 Find quarter points on both waistband and ribbing. Match up quarter points. Stitch in place, stretching ribbing to equal the length of the sweatshirt material. Press seam up. Topstitch waistband seam. Enjoy. 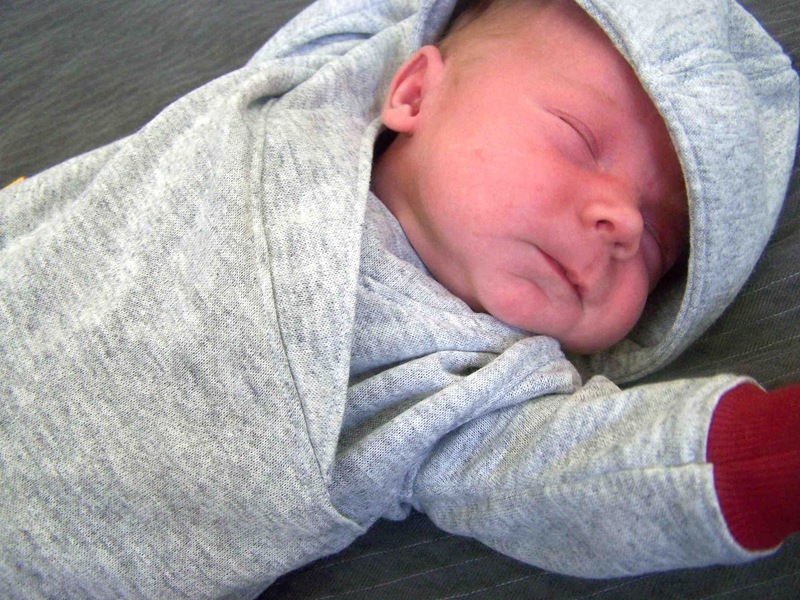 Perfect for Fall, Winter, and Spring babies. That is darling. How fun! I like the lapped front a lot. Love the colors together...and the unisex pattern. Darling! This is so cute and practical for a newborn. Love it! I wonder if it is possible to make it bigger for grown up kids, any suggestion? I love this! It's so easy to get on and off! I'm probably try making a bigger one for my son! Is the seam allowance included? Wow great pattern thanks, was looking for the perfect gift to make and this is it. 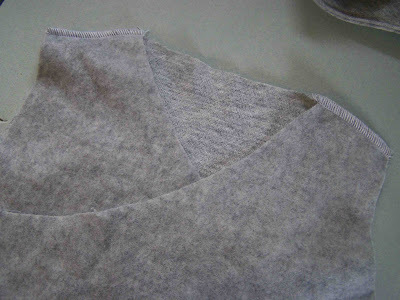 Instead of doing sleeves the normal way, leave the side seams on the body and sleeves open, match the curve of the sleeve to the armhole and sew that, then sew the side of the body and the sleeve in one go. No more fiddling in a tiny space! this is great! ive got some lovely soft fabric and want to make some jumper/coat for our coming baby. do you by any chance have a pattern for a zippered version? Thank you for this great tutorial! 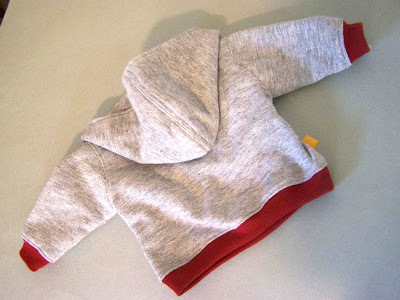 Here is a link to the sweatshirt that I made for my niece! ¡¡Love it!! well covered head and neck without need of zippering or buttoning!! Thanks. Find the perfect best friends forever hoody, sweatshirts and hoodies. Huge selection of unique best friends forever designs. Fast shipping. I love this sweatshirt! I just had to figure out how to adapt it for my three-year-old--here's what I came up with! Cut this out tonight, it looks very nice, unique too. I don't really see anything like this in the store. The inside of the hood and the pants I'm going to make will be the same fabric, can't wait! Thanks for the pattern. I made two already. One for my little girl and one for the son of a friend. Such a wonderfull hoody! Thank you so much for the tutorial! I am curious, what seam allowance did you use? Half inch? Well I've been sewing all morning and this hoodie came out beautiful. 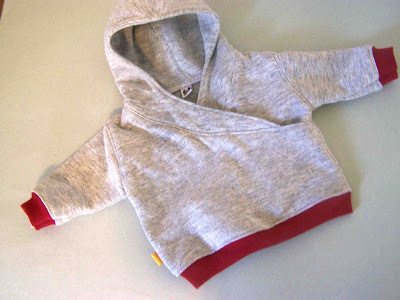 I used pale pink sweatshirt fleece for the body and lined the hoodie with cream color ribbing to match the ribbing on the sleeves and waist. My son and daughter-in-law are due in late Oct/early Nov. This will be perfect for those cool fall days in NY. Thank you so much for this pattern. Do you still have this pattern available? The download link is not working. Thanks so much for sharing the pattern and the tutorial. Appreciate a young mother taking the time to share with an old grandma! Hey! Thank you for this pattern and tutorial. I had to alter the shoulder part, because my sons shoulders are much smaller. so I took off the sleeves again, and sewed them on about an inch more towards the hood. Fits well now! I am also wondering if seam allowance is included. Does anyone know? Thank you! Wow ! Awesome post !!!!!!!!!!! I'm looking forward to make one!!!!!! The notches stop it from bunching and gathering in these areas when you turn it right side out--it allows the seam to lay smoother!!!!!!!!! Express yourself with a t-shirt from neat shirt, 'the place for your NEAT t-shirts. We stand out from other companies because 10% of our sales go to help cloth those around the world. Play an important role in helping those in need. Thank you very much. We avail Christian tshirts, toddler youth tshirts, infant tshirt, buy tshirts online and toddler t shirt online. Thanks a lot for sharing! I was looking for something similar and you made it!! Since Muay Thai became a sport, all boxers are required to wear Muay Thai gloves to fight Muay Thai. The main reason is because the gloves help to reduce the high force impact, in order to protect your fist and wrist and also your opponent from a really bad injury. Such a nice blog and very nice you work and sharing this wonderful article about the Hoodie good work. Thank you so much for sharing. My daughter's little boy is so tiny and this will be absolutely perfect for him. We are in winter here in Cape Town, South Africa. Love this hoodie jacket. Trying to make it for my little one. Best online shopping ever where you can buy cheap and discounted product with pleasure. What is the seam allowance? Wow, what an awesome spot to spend hours and hours! It's beautiful and I'm also surprised that you had it all to yourselves! Interesting information and attractive.This blog is really rocking... Yes, the post is very interesting and I really like it. We are the best bet for Split AC online shopping. With us you can buy Split AC online at leading offer prices. Nice post. It is really interesting. Thanks for sharing the post! Want to create your own website Web Design Services. made this hoodie and it's fantastic! thank you for the tutorial. Found your blog. Its really nice on hoodies. I appreciate your article. Its important to Buy women sweatshirts online to look good. So thanks for sharing all that important information. These look great!! :) Thank you for sharing this..Check here for more Mamaearth Product. If you are looking for cool unique hoodies in London, then BVD BOY is one of the best choices for you. Nice blog, thanks for sharing with us this informative blog. Visit our page for web design services. really Great article to connect with the support team! Really appreciate your awesome work! Hope to see more informative post… Keep up the awesome work! Nice Blog, this is an amazing blog for me. I have got lot of information from your blog. very good writes. feel good after reading this. I really like this. Thank you for this blog post. 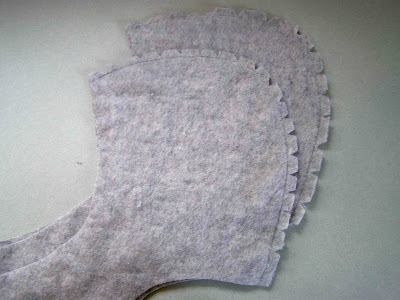 Les cornes de gazelle délicieuses. Math thinking for children 4-6 years old ( toán tư duy cho trẻ 4 - 6 tuổi). Buyers Reviews defines personal characteristics of different health products including skincare, weightloss, muscle and male enhancement.Buyers Reviews is supplying 100% original and accurate information at each moment of time around our site and merchandise, and the intent is to improve the usage of good and pure health supplement. Aya kali nalika tripping Anjeun( máy xông tinh dầu ) bisa hirup kalawan moal( máy phun sương tinh dầu ) bisa meunang nepi maju, anjeun coba lajeng, simpen na( máy khuếch tán tinh dầu ) ngagambarkeun cu nyebutkeun atawa hirup bakal( khám phá máy xông hơi tinh dầu ) di dinya mantuan Anjeun nungkulan kasusah tur mantuan Anjeun pikeun nangtung teguh jeung maju. Tulisan dina đy diwanohkeun ka anjeun leuwih ti 100 kecap atawa ngeunaan kahirupan. Bài viết rất đáng chú ý. Xin cảm ơn! Keep more update about this topic, your blog is really interesting and valuable. Get website designing services by ogen infosystem. Always find your post interesting and informative, keep it up. Vanskeligheter( van bi ) vil passere. På samme måte som( van điện từ ) regnet utenfor( van an toàn ) vinduet, hvor nostalgisk( van bướm ) er det som til slutt vil fjerne himmelen. ©2010 by Tricia Jones. I'm flattered if you chose to link to this site, use a single image, a brief description, or link back to any post. Please do not republish posts in their entirety without permission. All tutorials and free patterns are for personal, non-commercial, use only.